TS PGLCET 2019: It is a state level entrance exam conducted for candidates who wish to pursue their post graduation in law courses offered by institutes of Telangana State.TS PGLCET (Telangana State Post Graduate Law Common Entrance Test) is conducted by Osmania University(OU), Hyderabad. TS PGLCET 2019 exam is going to be held on May 20, 2019. Candidates who wish to appear for this exam need to register themselves online. To avoid any late fee candidates must submit the completed form before the scheduled date. Candidates can get complete details regarding the TS PGLCET 2019 exam on this page. Latest: TS PGLCET-2019 the last date of submitting the online application dates has been extended. Scroll down to check the same. Candidates can also submit it after the last date along with the late fee. 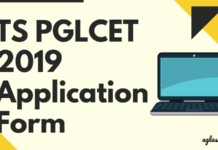 TS PGLCET 2019 application form is available online on the official website. For the selection of candidates, the entrance exam will be conducted on May 20, 2019. The table below comprises of all the important events of the TS PGLCET 2019 exam with their scheduled dates. a) Candidates holding LL.B. /B.L. degree on the date of application and candidates who have appeared/appearing for LL.B. /B.L. Final year examination are also eligible. However, he/she should pass the examination at the time of counselling for admission. b) The Candidates seeking admission into LL.M. (Private Appearance) of Osmania University, Hyderabad shall have a minimum experience of 3-years as judicial officer or 3-years standing as an advocate on the date of appearing for TS PGLCET-2019. A candidate appearing for LL.B. /B.L. degree final examination may take the TS PGLCET in anticipation of results. However he/she should pass the examination at the time of counselling. It is mandatory for the candidates to register themselves to appear in the TS PGLCET 2019 exam. TS PGLCET 2019 application form is now available online. Candidates must fill their application forms carefully without making any mistakes. Since, the application form will be in the online mode, keep scanned copies of photograph and signature ready. The application fees are Rs 1000 while it is Rs 600 for the SC/ ST category candidates. Application Form: Click here to apply for the TS LAWCET 2019. Click here to check the Application Fee Payment. Click here to check the Payment Status. Click here to check the Print Your Filled in Application Form. Click here to check the USER GUIDE . FAQS: Click here to check the FREQUENTLY ASKED QUESTIONS for TS PGLCET 2019. 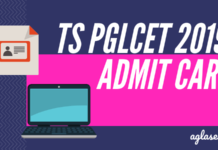 The TS PGLCET 2019 admit card will be available in the online mode. It is mandatory that the candidates carry the hall ticket along with a valid photo id proof on the day of examination. Candidates without valid Admit card will not be allowed to enter into the examination hall. Candidates can download the admit card from the official website by entering their application number and their date of birth. The TS PGLCET 2019 exam will be in the online mode. 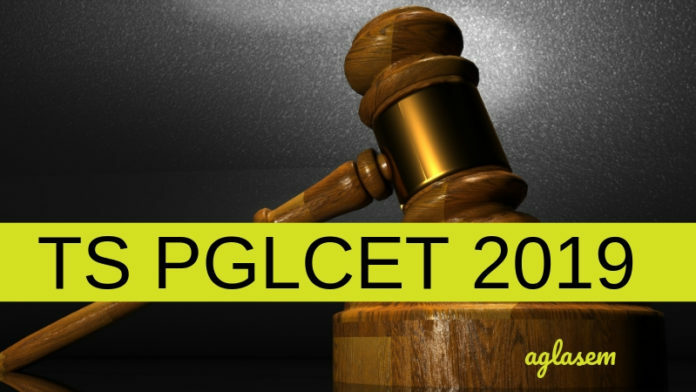 Candidates who are going to appear for TS PGLCET need to be thorough in topics related to Jurisprudence, Constitutional law, Crimes and Torts, Mercantile law, Public International law, Labour laws, IPR, and other related subjects. TS PGLCET 2019 provisional Answer key will be published first. Once the examination process is over candidates eagerly waits for the answer key to estimates score in the exam. Answer key will be published online and after clearing, objection officials will publish the final answer key. For more details on the answer key check Quick Links section. The TS PGLCET 2019 results are made available on the official website. Results evaluation will be done with great caution. Hence, officials will not entertain reassessment requests. The rank by the candidate will be valid to get admission in the 2019-20 academic session. The rank card of the candidates will be published on the official website approximately after 1 week of the result announcement. The qualifying percentage of marks in the Entrance Test is 25%. (i.e 30 marks out of 120 marks) There will be no qualifying marks for S.C & S.T candidates for ranking. a) Evaluation: Every care will be taken to avoid errors in evaluation, checking, scrutiny, tabulation and ranking. Hence, request for re-totalling or revaluation or personal identification of scripts will not be entertained. b) Ranking: The Candidates will be ranked as per the total marks obtained in the Entrance Test. If there is a tie in total marks, the marks obtained in Part-A of Entrance Test (in Jurisprudence and Constitutional Law) will be considered for awarding the rank. If the tie still persists they may be bracketed together for the purpose of ranking and seniority in age may be considered at the time of admission. c) Rank obtained in TS PGLCET-2019 is valid for admission into LL.M. courses for the academic year 2019-2020 only. Rank Card will not be sent by post. The candidates are advised to Download the Rank Card from the website pglcet.tsche.ac.in In case of any difficulty in downloading Rank Card the candidates are advised to contact the Convener’s office. Candidates whose name appeared in the merit list are eligible for the counselling. The candidates need to exercise the options of choosing the preferable Institute. Candidates who will make up in the counselling will be allotted seats the programme, Details for counselling of session 2018-19 are given below. Note: Applications for Spot Admission are accepted in concerned college on given date. 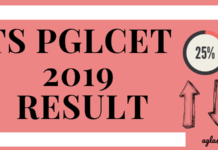 TS PGLCET 2019 Result – Get The Direct Link Here!